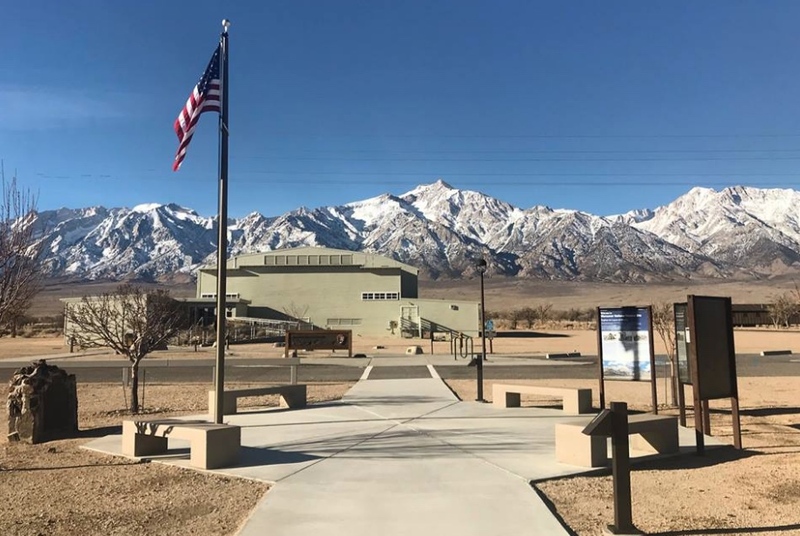 INDEPENDENCE — Manzanar National Historic Site invites visitors to participate in a weekend of special events in conjunction with the Manzanar Committee’s annual pilgrimage. The event’s theme is “50th Manzanar Pilgrimage: An Enduring Legacy for Civil Rights.” All are welcome and the events are free. Pilgrimage Weekend begins Friday, April 26, with a public reception hosted by the Friends of Eastern California Museum from 4 to 6 p.m. The museum, located at 155 Grant St. in Independence, features exhibits including Shiro and Mary Nomura’s Manzanar Collection, the Anna and O.K. Kelly Gallery of Native American Life, and exhibits on other facets of local and regional history. It is open daily from 10 a.m. to 5 p.m. The Manzanar National Historic Site Visitor Center is open 9 a.m. to 4:30 p.m. daily. On Saturday, April 27 only, the center will extend hours to 9 a.m. to 5:30 p.m. It features extensive exhibits and the award-winning film “Remembering Manzanar.” A special exhibit, “Manzanar Pilgrimage: Photographs from the Manzanar National Historic Site, 1983-2018” by Geri Ferguson and Mark Kirchner, is on display through July 28. Just outside the Visitor Center, Block 14 features two reconstructed barracks and a women’s latrine, as well as a restored World War II-era mess hall. The barracks exhibits offer an in-depth exploration of the challenges and changes people faced in their daily lives at Manzanar. A new exhibit, “Dust to Diplomas: Creating Schools in Manzanar,” is featured in the north end of Barracks 8. The mess hall exhibits highlight the logistics and politics of food in Manzanar. The women’s latrine powerfully evokes the humiliation people endured during private moments in public spaces. The program will be emceed by former Assemblymember Warren Furutani, one of the founders of the Manzanar Pilgrimage and the Manzanar Committee, and writer/artist traci kato-kiriyama. Attorney Dale Minami of Minami Tamaki LLP and Karen Korematsu, founder and executive director of the Fred T. Korematsu Institute, will be the featured speakers. After ondo dancing concludes, park rangers will offer tours to those wishing to explore Manzanar as they walk one mile from the cemetery back to the Visitor Center. In addition, volunteers from the Inyo-Mono Master Gardeners program will be stationed at Japanese gardens throughout Manzanar to provide information and answer questions. The Manzanar At Dusk program begins at 5 p.m. Saturday at Lone Pine High School, located at 538 S. Main St. (Hwy. 395) in Lone Pine. The program offers participants opportunities for intergenerational discussions and sharing. The program is co-sponsored by the Nikkei Student Unions of Cal State Fullerton, Cal State Long Beach, Cal Poly Pomona, UCLA, and UCSD. At 11 a.m. on Sunday, April 28, Duncan Ryūken Williams, a Soto Zen Buddhist priest and director of the USC Shinso Ito Center for Japanese Religions and Culture, will speak about his new book, “American Sutra: A Story of Faith and Freedom in the Second World War.” This groundbreaking history tells the little-known story of how, in one of our country’s darkest hours, Japanese Americans fought to defend their faith and preserve religious freedom. The program takes place in the Visitor Center’s West Theater. The Eastern Sierra Interpretive Association will host a book-signing after the program. There is no food service at Manzanar; bring your own chair, a water bottle, and lunch or snacks. Wear sunscreen, a hat, comfortable shoes, and dress for the weather. For more information on Manzanar, call (760) 878-2194, ext. 3310 or visit www.nps.gov/manz. Additional pilgrimage program information is posted on the Manzanar Committee blog at https://manzanarcommittee.org.